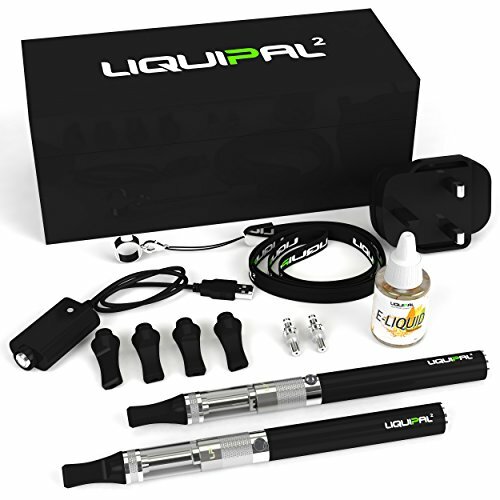 LiquiPal Squared is one of the few sets that comes not only with two vapor pens and accessories, but also with vape liquid included so you can start using it right out of the box! Also included is a user manual and access to 24/7 customer support. You don’t have to have a big battery for extended life. The slim, compact 1000mAh rechargable batteries of our vape pen units are covered in a smooth protective layer to keep them dry and safe from water vapour, ensuring a long life for your e cig investment. The LiquiPal clearomiser offers a simpler and more easy-to-use design than other atomizer designs. Their built-in fluid leakage prevention system eliminates burning tastes and saves you money over the lifespan of your vapestick. Using a vaporizer is the healthy, green, and affordable alternative to traditional cigarettes. Discover how LiquiPal electronic cigarettes can help you get your freedom back with life on your terms, while still giving you a satisfying experience and flavor with liquid instead of smoke. Nicotine Free/No Nicotine. We’re so sure that you’ll love our LiquiPal Squared e cigarette starter kit that we guarantee it! If you don’t love it, get a full refund. No questions asked! This product IS NOT for sale to persons under 18 years of age. Proof of age and a signature may be required on delivery. Quit Smoking: Inhaler not helping you quit? Using an e cigarette as a replacement for a traditional cigarette with or without nicotine aids you in breaking the habit. Still get a satisfying experience with e vapour liquid flavours of your choice. No smoke, ash, tar, or tobacco. Nicotine Free/No Nicotine. Superior Mod Design – The Liquipal vapouriser offers a better design than other atomisers and e cigs. Our unique clearomizer tank along with the design of the coil and wick provide a smooth, satisfying and realistic vape that you don’t find with most other electronic cigarette designs. Bonus Lanyard Holder and Gift Box – Our starter set comes with a free vapour pen lanyard so you can keep your portable ecig with you at all times – hands-free! The resilient black gift box is the perfect place for storing flavour liquids, oil bottles and accessories. Hookah and Shisha – Why spend money on a disposable shisha pen or vaporiser that will only last for a certain number of puffs? Our rechargeable, refillable e shisha pens will give you many hours of use and are compatible with refills of all sorts of vape juice. Start vaping today with our e Cigarette Starter Kit – LiquiPal Squared comes with two clearomizer tanks, two extra coils and wicks, two battery units, 1 x USB charger and 1 x mains plug, 6 mouthpiece tips, and even 15ml of tobacco-flavored no-nicotine e liquid!